Train & Defend ammunition provides gun owners with matched pairs of inexpensive FMJ "Train" and premium JHP "Defend" cartridges. This enables shooters to train with what they carry, experiencing the same recoil and ballistics at the range that they would in a self-defense situation. 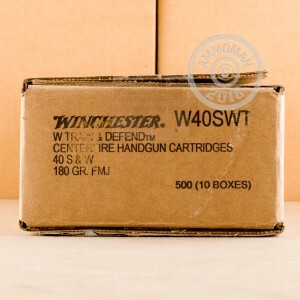 This .40 S&W load belongs to the "Train" component and comes in boxes of 50. 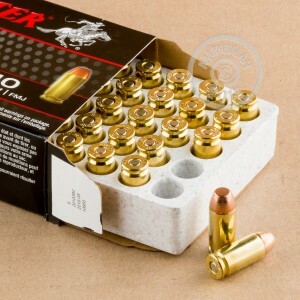 Optimized to mitigate the harsh recoil of the .40 cartridge, these rounds fire a 180 grain full metal jacket bullet at about 925 feet per second. 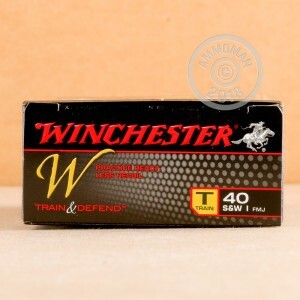 Like other Winchester ammo, they use non-corrosive Boxer primers and brass cases. Pick up your choice of Train & Defend ammo or any other products totaling $99 or more at AmmoMan.com to qualify for free shipping!